In the PACC 2017 I made 51 QSO's. In most QSO's I used 800 mW by giving CQ or by using S&P. The 20 m was good for most of the QSO's. Friday before the PACC I made an End fed antenna with about 20 meters of wire. Just as my holiday antenna's the wire is feeded via a twin lead that acts as counter pose and impedance transformer. I applied linear loading to make the wire fit in my garden. This antenna is a great success. Inside Europe I could make QSO's with QRPp running with just 800 mW. With 800 mW all QSO's over a distance of more than 800 miles (1280 km) are good for more than 1000 miles per watt. After the contest I counted 38 QSO's with more than 1000 miles per watt in my log. The power of 800 mW was not enough in every QSO. I had to increase my power to 3.6 W, to work K6ND and P3YA and a few other stations. The antenna is a great success. I could run with QRPp with a power of 800 mW. As a milliwatt enthusiast I often use the lowest possible power from QSO to QSO in other contests. Then I use Search and Pounce. (S&P) But when I give CQ, it is more difficult to copy the call than when I use Search and Pounce. Most of the time I must hear the call twice to copy the call. I enjoyed meeting operators that were patient. FB. At first I did not think about contesting at all, because my inverted V is damaged. In the summer I had great fun with my cylinder dipole with Monster cans on 15 m with a power of 3 watts. When I was on the Veron club meeting, I heard that the avid contesters were preparing for our annual contest from the Netherlands, the PACC. So I also got inspired to participate. But with what kind of antenna? I did not want to use the indoor cylinder dipole with Monster cans. Because of it's low height of 4 meter above ground level, a power of 3 or 4 W would be needed. And with winter propagation, it is not even sure, whether the 15 m band will be open. But most of all I wanted to participate with QRPp on 20 m.
So I begun thinking about an outdoor antenna. With more height I can use less power. To limit the activities on the roof, I came up with an end fed. I had a wire that was too long. But I decided to put it up and see. So on Friday afternoon before the PACC I ended up with this end fed. To get the power into the wire, without radiation in the shack, I use 300 ohm twin lead. The twin lead also acts as an impedance transformer. I always use a tuner with my antennas. So whatever the impedance at the end of the wire may be, as long I can adjust the SWR to 1:1 it's fine with me. The twin lead has to be long enough to tune. A twin lead of 4 meters works fine on 14 MHz. 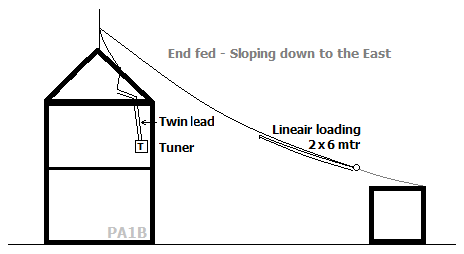 I use this type of feeding by twin lead for all my end fed holiday antenna's since 2001. WSPR is a beacon system that is designed for low power. How low can you go? Martin G4EFE ran WSPR with very low power. So I've had a little time for some experimentation, and the results - I think - are spectacular. Attenuating the output to just 1mW netted me several spots from neighboring countries. Best DX was GM* at 711km, who reports me at -18b dB SNR, suggesting I can go even lower. So today I'm running just 100 MICROWATTS. I can't believe anyone will spot me, but I'm the optimistic kind! Thanks again, Bert, for this easy and fun station accessory. OK Martin, thank you for sharing this fine info. Martin started with 5 milliwatt for three days, as you can see in both tables. On the 5th the power was reduced to 2 milliwatt. On the 6th Martin had great fun in 21 spots with just 1 milliwatt. To make a power of 1 milliwatt Martin uses his IC703, at it's lowest setting with 100 mW and an attenuator of 20 dB. His antenna is a full-size 40 m square loop. As I saw on WSPRnet. 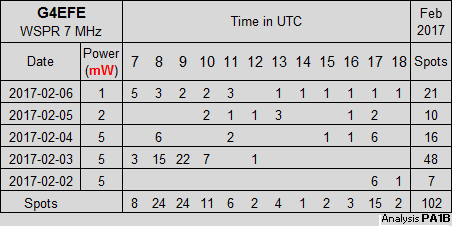 In the table below you can see the number of spots in each hour. The days go from the bottom to the top. The number of spots vary from day to day. this is not only propagation. Martin is constantly transmitting, but the listeners can be jumping from band to band. 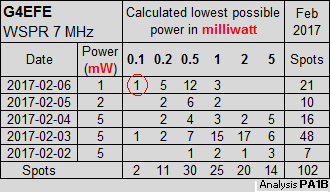 The best DX from GM*with a SNR of -18 dB, that Martin refers to, gives a calculated lowest possible power of 0.1 milliwatt. This spot could be made with 0.1 mW and still be a solid copy with a SNR of -28 dB. See the spot in the red circle in the table below. 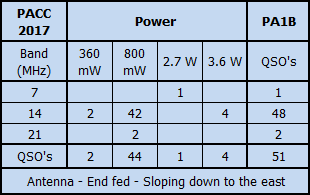 The better the propagation, the better the SNR will be and the lower the Calculated lowest possible power. The Calculated lowest possible power is calculated from the power and the SNR.